"Union major general. Commanding General of the Corps D'Afrique, which evolved from five regiments of black troops raised by Ullmann in Louisiana in 1863. These regiments were the first black troops ordered raised by the Union." Daniel Ullmann was born in Wilmington, Delaware in 1810. 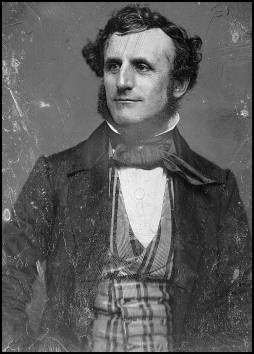 A graduate of Yale (1829) and Madison (1861) universities and member of the New York bar, Ullmann ran unsuccessfully for Governor in 1854 on the American or Know-Nothing ticket. As colonel of the 78th New York Volunteers, he was captured at Cedar Mountain in August of 1862 and sent to Libby prison. He was paroled in October of the same year. Ullmann met with Lincoln late in 1862, and tried to convince the President to enlist black troops. Initially, Lincoln had misgivings, but called Ullmann back to further discuss the idea. In January of 1863, Ullmann was promoted to brigadier general and sent to Louisiana under General Banks. As ordered, he raised five regiments of black troops there. The units were later designated as the Corps D'Afrique. He commanded Ullmann's brigade at Port Hudson, then commanded the post at Port Hudson. After a number of reorganizations and redesignations, Ullmann found himself in Morganza, Louisiana, in command of a brigade of black troops. At times, disease was a greater danger to his command than Confederate forces in the area. The evolution of black units was not without its problems. Ullmann complained that commanders in the field often chose to use black troops as "diggers and drudges", doing work that white troops disliked. Complaints of this sort led to Secretary of War Edwin Stanton acting to equalize fatigue duty between white and black troops. Ullmann also made the point that often the white officers appointed to black units were less than competent. Regiments raised by Ullmann to form the Corps D'Afrique were later redesignated as United States Colored Troops, and performed well in the siege of Mobile in the spring of 1865. On 26 Feb 1865, Ullmann was removed from command and ordered to report to New Orleans. Reports indicate that he had a severe alcohol problem at the time. On 13 Mar 1865, he was brevetted to major general. He was mustered out on 24 Aug 1865 and made major general in November 1865. After the war, Ullmann involved himself with literary and scientific studies. In a speech before the Soldier's and Sailor's Union of New York, he advocated equality of education and universal suffrage as tools for the "regeneration of the South". He died on 20 Sep 1892 in Nyack, New York, and is buried there.